manuals. Do not permit shortcuts in adjustments. Any variations in adjustments, or disregard for the instruc- tions found in the operating manuals, will leave you with a pile of useless material or an inconsistent building. 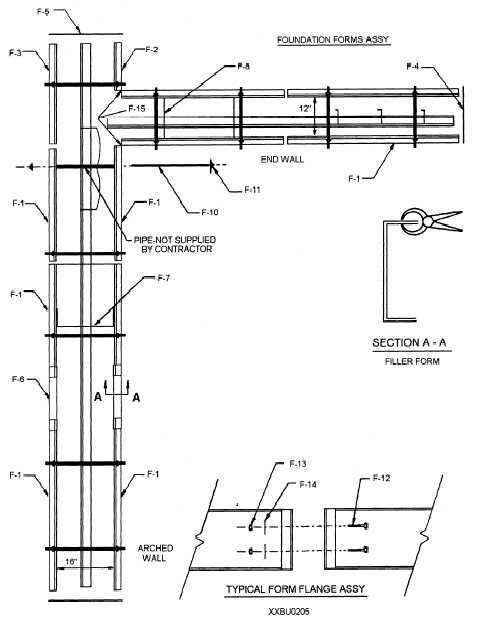 The design of the foundation for a K-SPAN building depends on the size of the building (MIC 120 or MIC 240), the existing soil conditions, and the wind load. The foundation must be approved by a certified engineer. The foundations for the buildings are easy to construct when you have the right equipment and crew. The roof and wall loads are transferred to the foundation through the base of each arch. Therefore, all loads are uniformly carried down each sidewall by continuous strip footing. The foundations are more economical than foundations of more conventional buildings. The concrete forms and accessories provide sufficient material to form the foundations for a building 100 feet long by 50 feet wide. When a different configuration is required, forms are available from the manufacturer. Figure 9-13. - Simple form assembly.